Who Are The Razor Company? Since the year 2000, Razor has been a leading manufacturer of the highest quality kids ride on toys, such as bikes, electric scooters snowboards, kids kick scooters and even adult kick scooters. The company has focused on making the most durable and long lasting products available, and they are still going strong today as evidenced by one of their most recent releases. The kid-friendly "Power Rider 360"! The Power Rider 360 is an electric tricycle that has two fully tilted rear caster wheels, enabling it to turn a full 360 degrees. The tricycle itself is one of the coolest electric ride-ons that we have seen. Great for spinning around the yard and easy to put together. The trike has a push button throttle, manual hand brakes, and can support up to 120 pounds. It can travel up to 9 mph and will provide your child with loads of fun, as it speeds, drifts and spins! There is a small amount of assembly required with the Power Rider 360. In the box you will find the handle bars and front wheel (pre assembled) and separate from that are the seat, rear wheels, the body, and all the necessary screws you will need for assembly. Also included is a non-standard battery and charger. And don't forget the nifty racing flag (optional) for decoration! The bike comes with an easy to follow instruction manual that has step-by-step instructions on how to assemble your trike. The manual also includes trouble shooting tips, to use in the event that the bike malfunctions in some way, and a toll free number to call if further issues occur. Razor offers a 90 days warranty on this product. The front wheel assembly, handle bars, grips and brakes are pre assembled and extremely well put together. The wheels are made from rubber and are connected to a chain-driven motor in the front panel. 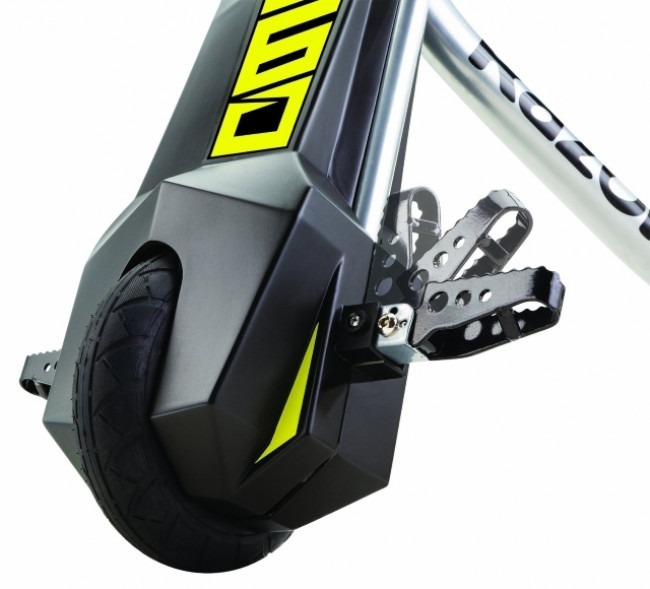 The front of the bike also sports two flip-down foot pegs for your feet to rest on. The front wheel is a high impact pneumatic tire, and both back wheels are capable of turning a full 360 degrees. The trike's frame is made from welded steel, and comes in a moto-style fork design. The battery is a 12 volt, lead based acid, and fully rechargeable. It fits snug in the front panel when it is ready to use. It is recommended to charge the battery after every use for at least 12 hours. A full charge tends to allow 30 - 45 minutes of riding time, and the fully assembled bike weighs about 34 pounds. Putting the Power Rider 360 together was simple as it only came in a few separate parts. First, attach the middle frame to the back wheels using the screws provided. Next, attach the frame's front end to the front wheel and handlebars, and make sure that it turns easily and is not too loose. Finally, attach the seat (and the flag if you want), and you are ready to go! Try having the battery fully charged before you assemble the bike! Alternatively, rather than give this as a gift in the box, it would be a great gift for a child to receive already fully assembled. That way you can charge the battery the night before and your excited offspring will not have to wait any longer as once the trike is fully assembled, and the battery fully charged and installed, it is ready for use! How Is The 360 Power Riders Ride? The great thing about this electric trike / tricycle / bike is its ability to slide in a full circle and stop on a dime. Time and time again, I have seen my son go speeding in a straight line, and then spin around 180 degrees, stop, and continue to do that over and over. The rider sits close to the ground, and since the bike doesn't go too fast, the fear of him getting injured is not very high. The rear wheels sit below a long crossbar, adding stability for the rider when making sharp turns, or just spinning in circles. The flip-down foot pegs offer a relaxed sitting position, and the rubber handles ensure a good grip. The brakes work fantastically well, as the bike can stop just as quickly as it starts. 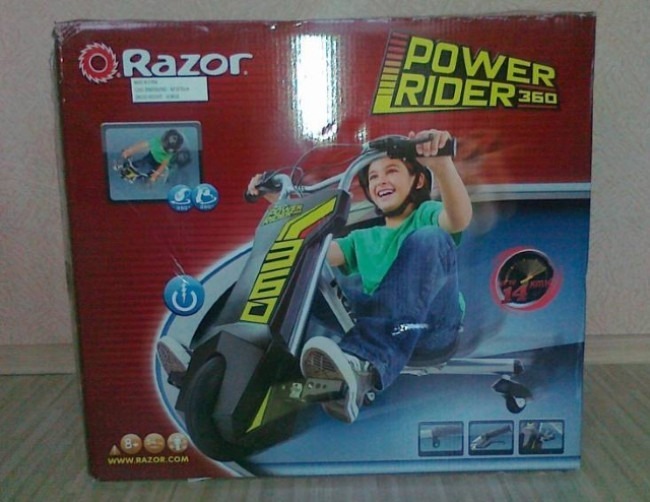 The Power Rider 360 from Razor is a great toy for your child. At first, I was concerned that the bike may roll over when I saw how sharply my son was turning on it. However, the solid frame and wide back-end design prevent that from happening. Not only is it really fun to watch him play on the Power Rider, but assembling it together was a great experience and by that I mean straighforward and did not take too long. Our only issue is that we wish that the battery life was a bit longer, as it only allows a short period of time before having to be recharged. The battery life or length of charge is an issue with most electric ride-on toys these days. It's really a case of the technology is not that advanced in batteries righ now. They are not small and long lasting enough to power a toy like this. A bigger and heavier battery would be the only other option but that would not be practical in this little fast-mover. All in all, my son loves this toy and if he is happy then that's all that matters, especially as the amount of hours he has used it must have run into hundreds by now. His friends come around just to play on it in our yard. If I can offer any advice with this trike it's to stock up on snacks for the neighborhood kids who will all want to play on this great Power Rider! 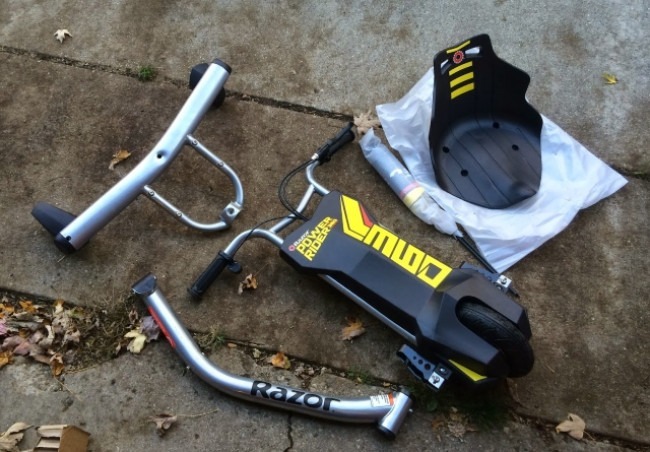 Take a look at the other Best Kids Electric Vehicle reviews or go ahead and get hold of this Razor Power Rider 360 right now. This power rider 360 really is is a grat fun sit-down trike and the battery will last at least half a day of riding!